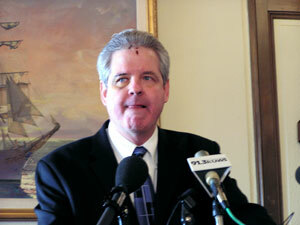 Duluth, Minn. — Duluth Mayor Herb Bergson says he's pleading no contest to drunk driving charges. Bergson was arrested Friday after his car hit a bridge near Spooner Wiscn. Bergson says he drank four-and-a-half drinks, got in his car and began a three-hour drive to Eau Claire. "This was probably this biggest mistake of my life," he said at a news conference on Thursday. "I will live with it forever. I am very grateful that I only have a concussion, about a dozen stitches, some headaches and some bumps and bruises." Bergson says he doesn't have an alcohol problem, but he will abide by whatever he's told to do after mandatory alcohol assessment. "I can tell them that I'm not going to do it again, but I need to prove that ... I, I have no desire to drink alcohol. I've decided that I'll never drink again," he said. Bergson says he's paying a fine of more than $700 and losing his license for six months. Bergson says he's made no decision whether he'll seek re-election in two years. He says it's important to refocus on important issues like the cost of health care for Duluth retirees health.